in crafting amazing software that people love using. apps since the iPhone and Android were created. Mobile is all we do. to turn great ideas into awesome code. We provide companies with a highly experienced and proven mobile engineering team to accelerate existing software projects or to launch an app. Here are some other reasons why you should work with us. What really sets us apart from others is that we have built apps with millions of downloads and users. From app strategy to coding, we know what it takes to make a successful app. We've been building iOS and Android apps since both mobile platforms were released. Before that, we worked on Palm OS and Windows Mobile. We are all about mobile software. Java, Ruby, Tomkat, Linux, Java, and MySQL are just some server technologies we use everyday. Our team are experts at building data platforms that scale and give users amazing app experiences. We are passionate about crafting apps that are elegant and beautiful. Our team works closely with UI/UX designers to make amazing apps that people love using everyday. "Tecarta is a respected and critical business partner. Our relationship is collaborative, innovative and mission driven." We partnered with HarperCollins Publishing, a News Corp. owned company, to develop an iOS and Android app platform for its top-selling Bible and related content. The results? Millions of downloads and a growing base of over 1.2 million users. App users easily build their own libraries via an intelligent in-app store. Facebook and Twitter integration allow users to easily share content with other people. FirstRain is the world's first analytics platform that brings together external and internal unstructured data to coach teams and professionals on key business developments that affect their go-to-market strategy, business relationships, and investments. Tecarta worked closely with FirstRain's engineering team to extend its analytics platform to mobile. "Tecarta is a vital partner with deep expertise in both backend architecture and mobile development and provides engineering and consulting expertise to help us deliver and accelerate key mobile projects."" "Tecarta was the first company I thought about when I needed to get our app to market." Gamgee is a fast-growing startup backed by Khosla Ventures and Nuance Communications. Tecarta provided both application development and backend server expertise to help launch the 22otters app. 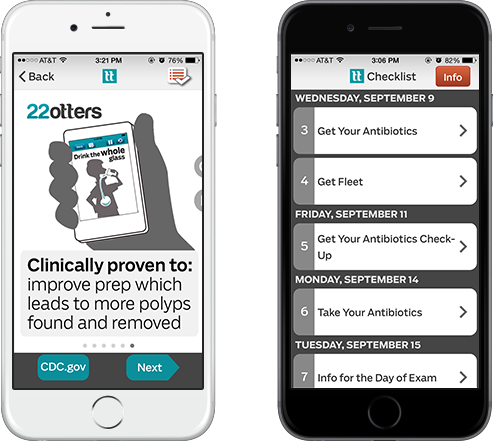 22otters has been called by providers the 'best mobile health app around' and perfectly supports the 'non-face-to-face communication' required for CMS-reimbursable chronic care management. "Tecarta has been a key part of helping our engineering team build the #1 medical reference app in the world." We have been developing iOS and Android apps since their release. We provide companies a deep and experienced knowledge base of mobile software, backend data technology and web development. We provide our partners expert professional services on application development, architecture, strategy or problem solving. We are located in Palo Alto, California. If you are in neighborhood, come by for a visit. Copyright © 2016 Tecarta, inc.. All Rights Reserved.